I love Cannas now that I live in New England. When I lived in The South they were used in highway medians so I saw them all the time and didn't think much about them. I don't have a huge amount of unplanted garden so mine are grown in (very large) pots. Since they don't tend to bloom much in the pots I buy ones with colorful foliage. Are you thinking of having all of the yard be the same color or adding some diversity there? 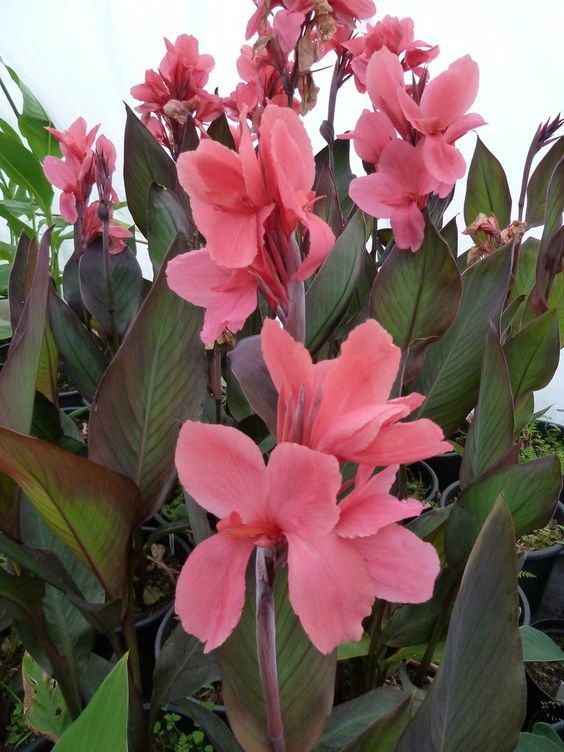 Maybe you could start breeding new varieties of Canna in your spare time (and space) :). PS. You will be pleased to know that I did NOT order one of these (http://www.logees.com/corpse-flower-amorphophallus-titanum.html) to be shipped to you from Logee's. Your picture of the square bed doesn't look anywhere near as big as "10-15 feet on a side" unless those are mammoth cannas. Thanks for the mention & link, I've already gotten several hits from it! 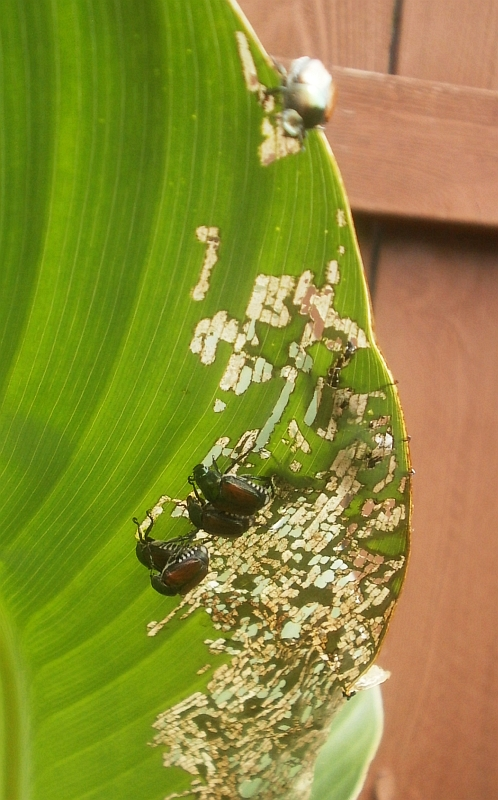 Regarding pests, I have been VERY fortunate; I have yet to see a japanese beetle, the scourge of cannas (and hibiscus, and so many others plants) everywhere, but one nice thing about living in the city is that no lawns = no japanese beetles. 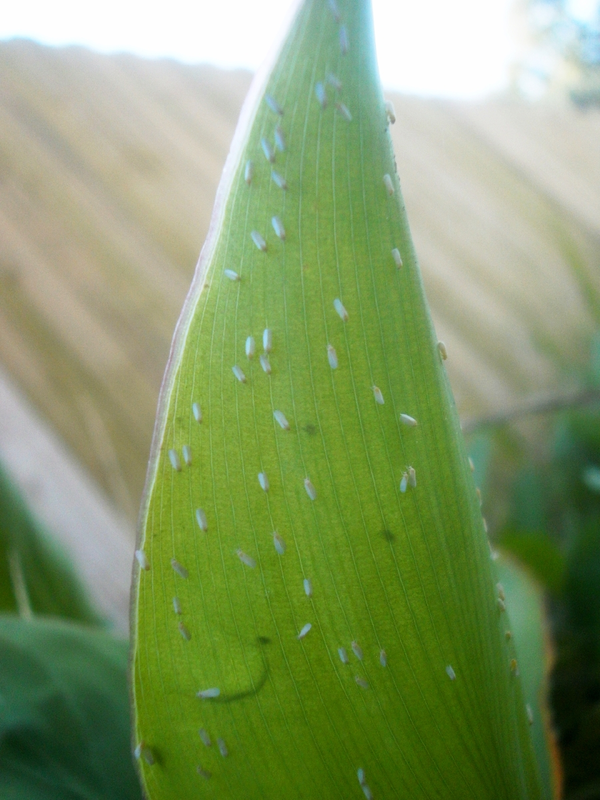 I have also dodged canna leaf roller, which is apparently a serious pest just a bit south of Washington, DC. The other thing to watch out for is virus, a widespread and devastating problem of cannas in recent year but again something I've been very lucky to avoid. Treasure your virus-free stock, and ruthlessly cull and destroy any cannas that show any kind of spotting or streaking on the leaves. All green! Not interested in the dark-leaved varieties? I actually would love to have an Amorphophallus titanum, except that I get the impression that they need higher humidity than I could provide most of the time, even if I had it outdoors. I mean, there's the size thing too. But mostly I just don't think one would do well here. You are correct. Though I was sort of close. 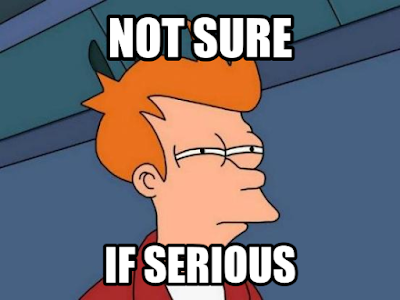 I measured the bed this morning, and got 93 x 113 inches, so not-quite 8 feet by not-quite 10 feet. Post will be edited accordingly. Thanks for stopping by. I keep meaning to ask you about your Begonia-breeding project. What a stunning Canna planting (or 3), I am impressed! Around here they're very popular but usually seen mixed in with other plants, not in a stand alone display like yours. Oh - we've got the whitefly thing going on this year. It's gross. Absolutely love your Cannas! I think the tall bright green leaves and stems with those red red flowers are brilliant. Of course I want to know the name of it, any ideas. It looks like a species canna and probably why I like it so much. To my untrained eye (I would need a microscope or loop at the very least) and depending on which of the two Canna taxonomists you go with, Maas or Tanaka, this looks like C.indica or C. coccinea respectively. Im not fond of those stunted ones with huge floppy balls of flowers, though some of the shorter foliage ones are nice for pots in zone typhoon. Im not a filler, spiller and thriller type painting by numbers gardener but a single canna with a nice contrasting short, even, ground cover (it may spill all it wants, it will still thrill and fill) in a pot looks zen enough for me to plant one or two in containers every year. The aquatics with those narrow upright lovely waxy blue glaucous leaves look particularly good in large water urns. You will be pleased to know even in the tropics most cannas cultivars need to be dug up. The reason for this is they need that rest or they don't flower so well after the initial mad rush and flush of growth and flower in those extended( (continual) tropical zones. They exhaust themselves and go downhill quite rapidly often succumbing to fugal or bacterial diseases. Climates with very well defined dry and wet seasons fare better leaving them in the ground but dividing the rhizome periodically increases vigour and flowers as the old unproductive parts under ground eventual die and rot taking the rest with it. In parts of India they lift them up, lay them on the ground exposed exact same spot leaving them three or four weeks, plant them again adding compost and they resume growth and flower with renewed vigour. Lift them up leave them etc about two or three times a year. So you have it quite easy in really. As yours are fertile you can plant the seed and expect completely virus free plants as a result. I wouldn't introduce new varieties unless you know they have been grown from seed and are virus free. They could infect yours with all those insects around and yours look wonderfully healthy. Im quite surprised you had white fly etc maybe the farmer next door didn't use pesticides one year. 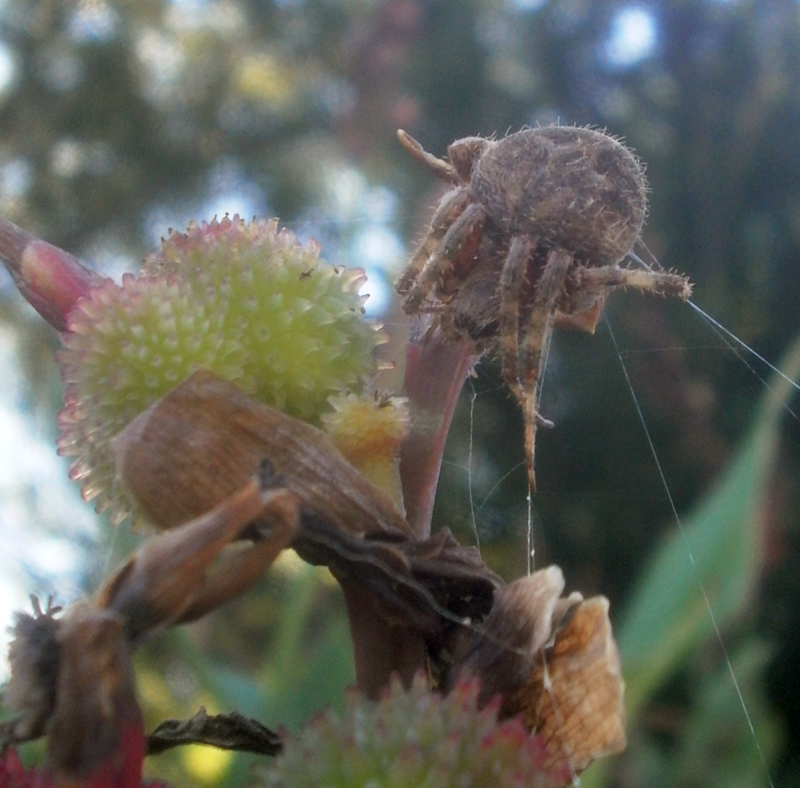 Those spiders look scary, Im particularly afraid of anything with a big fat soft abdomen and short sausage like twitching legs. That to me signals killer. The result of too many wild life programmes set in Australia where the lethal trap door spider is often central. Though I don't live in Australia I often dig up similar looking things and it scares me half to death. I would've back handed that thing into the soya plantation and beyond! It really doesn't look like it should be sitting on top of a canna flower like that! I love the idea of a canna maze! Judging by the number of cannas you already have and unless you have meter deep soft sand for soil that already looks like extremely back breaking work! You should get hold of a mini sit on excavator! He will be planning mazes in his sleep, guaranteed. No idea on the ID; they didn't come with one, and I've never really tried to figure it out. In 2017, I collected a bunch of seeds from a different variety (also NOID; red flowers on leaves that looked more or less like these) and am trying to work out where to sow them such that they're not immediately swallowed by the green variety from the post; probably they'll have to be started in a pot, which is terrible, because I just used up the last of my potting soil and won't have money to buy more for a couple weeks. 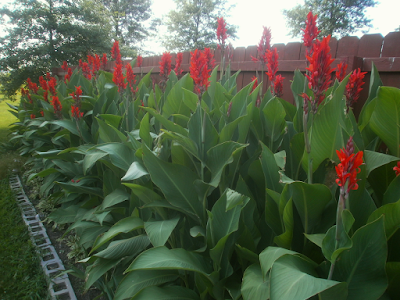 We added a new bed last year and are doubling its size this year; the husband has begun inquiring as to whether we might, at long last, have enough Cannas, in a way that hints that as long as he's doing all the digging up and planting, we definitely have enough Cannas. No (or at least insignificant) whitefly last year, but the Japanese beetles were horrific -- a neighbor saw a whole linden tree completely defoliated in three or four days. Actually very anxious about this year as a result, though the husband claims to have only seen one JB grub so far while turning over the soil, so maybe it won't be as bad as I fear. Hi! I would love to grow your canna. Unfortunately we have very high winds, typhoons and they get shredded. A shorter one with the same nice habit and upright brilliant flowers would be fantastic but I haven't seen it yet. I think yours could very well be what they call "Robert Kemp" a selection of indica or compacta if you're taking Tanaka's view of things. Look it up it's unmistakable. Must be my favourite Canna too. 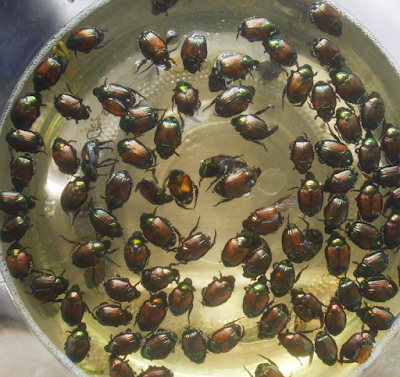 I looked up Japanese beetles, thankfully we don't get those here, we do get enough of everything else though. Do they eat up plant roots as well! We get a similar soil grub but it's "pot weevil", eats all the roots and the plant falls over. I like the idea of growing Canna from seed, the surprise seeing what you have. You would need to scarify them which is a bit of job but then any soil would do even plain garden soil. They're very quick from seed. Thanks for those inspiring pictures. The initial round of seed-grown Cannas are probably not going to be particularly varied: I collected the seeds from a group of six or seven plants of the same cultivar, which were all growing pretty close together, far away from other Cannas. I suppose it's possible that the original cultivar was a hybrid, in which case there might be variation, but I'm kind of expecting them to breed true. I used to scarify before planting, but probably won't this year: a few years back I had a big batch of seeds I scarified and soaked in water, and then when I planted them outside, only about 1/3 of them actually germinated and grew at all. Another year, I just scattered a bunch of seed without scarifying, and . . . about 1/3 of them germinated. There could be a lot of reasons why I would get those results, and I don't feel like I've proven that scarifying and soaking doesn't matter, but since there are a lot of seeds, and they're kind of a pain to scarify, I'll probably just dump them onto some soil and let them figure out for themselves how and when to germinate. Oh I think you might be surprised, very few Cannas breed true from see except species. Even if they self pollinate, which they can, you get variations. Im over the moon as I found some fertile F1 seed grown crosses, the 'Canna Cannova" series produced by Takii seeds in Japan. I would like to get hold of the "Tropical" series by the same. Anyway this means they should be completely virus free and being fertile I can have some fun using pollen from elsewhere. 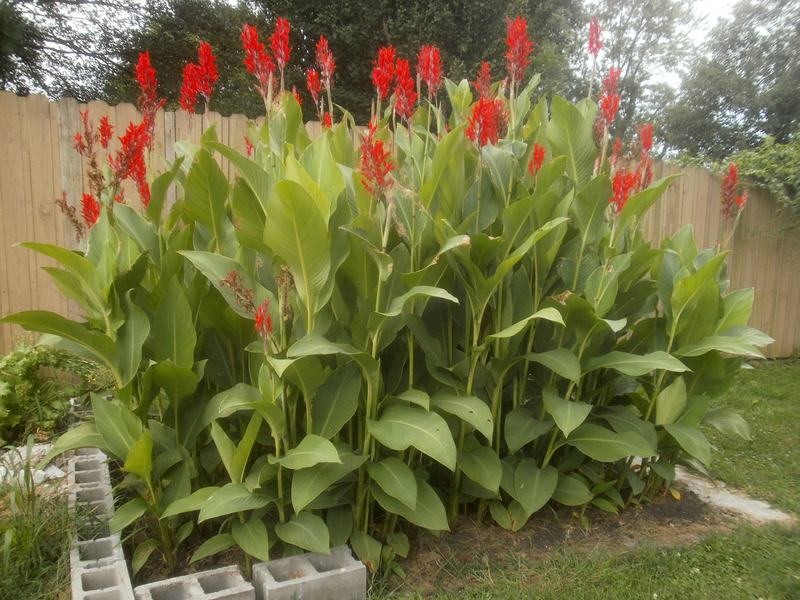 They're short to medium cannas with not such overblown flower heads so should just be OK with wind. Yes I imagine scarifying lots of Canna seed by hand can't be fun. If you put the seed in a strong bag with sand or sand-paper shreds (anything abrasive) then put that into your clothes dryer or washing machine you can do bulk. Interesting they came up without scarification, was this after a year or two in the ground? Sometimes hot then cold weather is all it takes to crack the outer coat. Oh no our weevil larvae love tubers, ranything root like. They mostly go for pot plants outdoors. I treated the soil in my pots with a special parasitic micro worm which seems to have done the trick. You cant get them here so a friend brought them back from the UK. Had fun with buckets and buckets of warm water mixing the living worm culture, drenching everything with the solution. Perfectly harmless to humans but the idea was still a little strange at first. Japanese beetles would be the last straw. I must be very careful where I get my plants and treat with a soil drench of pesticide if from outside. Unfortunately a friend just came back from America with packets and packets of Cannas for me from America. He knows I like them. About 100 dollars worth of some nice cultivars we don't get here. Bought from a place called Walmart. All dead, not a single living eye, brown black dead rhizomes. Funny they weren't squishy, hard but dead so they must have treated with some kind of preservative. Was so disappointing. I burnt them all. I as worried about virus from store bought rhizomes anyway so just as well none were viable. Not clear where you are, geographically, but around here there's no such thing as preventing Japanese beetles -- they're not native and don't seem to have much in the way of predators, and they're willing to eat so many different things that even if you can get all of them out of your yard, they can fly over from your neighbors. Last year, I spent a lot of time collecting them in a jar of soapy water, and I could see new beetles flying in the whole time I was knocking the ones that were already here into the jar. So depressing.